Just in time for May Day, when the French traditionally give each other gifts of lily-of-the-valley, Guerlain launched limited-edition Muguet. This year the perfume will come in "a re-release of their quadri-lobe crystal bottle from the Verrerie Royale de Romesnil – created in 1776 and no longer in existence. Muguet will be available from the Maison Guerlain on the Champs Elysées, as well as in the other Maisons Guerlain worldwide (Neiman Marcus, San Francisco; Bergdorf New York and Toronto)." (Info from Osmoz) I am consumed with mad, burning desire to own this exquisite lily of the valley in its beautiful bottle. By the way, lily of the valley week is coming up on Perfume-Smellin' Things very soon, followed by lily, jasmine, tuberose, and gardenia. White-floral haters, beware! Oh, No 22 must be bought first :-) It is perfection. I noticed the bottle the very moment when I clicked on the first page of (newly dressed ;-)) PST today. I wish your wish came true, M! I am looking forward to following (white floral) weeks very much. sooo excited! however, I do not, I repeat, *do not* need any new lemming(s). so please handle with care ;-)! Thank you! How do you feel about lily of the valley? so true. I couldn't even imagine liking, what else wearing a perfume with leather notes. after smelling Daim Blond, it's one of my biggest FB lemmings right now ;-). by the way, I am having great expectations for Kelly Caleche too. floral leather, it should be great. i am in lovw with my new treasure le parfum de Chanel No. 22. ! It is magical.it's perfect for day, evening, sensual endeavors feminine , soft and unique. Bois Des Iles - my standard fave may soon be No. deux . Diorissimo is my holy grail - lily of the Valley. Do you know the cost of Guerlain's Muguet ? I am close to Bergdorf's - if necessary . My wish list : Miss Dior and Chanel No. 19 - parfum. Well, I am sure I do need this--but I am trying to cut down on my spending, and I think I probably need the Hermes more. . . 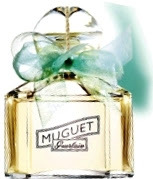 I think, and I am not sure, that Muguet is 200 Euro for 20ml. Ouch. I like that bottle, but since cjblue commented on MUA that the of the bottle top looks like ... a top of something else (something not made of glass), I always feel embarrassed looking at that bottle. I can`t forget that remark. Naughty CJ! Oh please, don't remind me ! :-) Naughty CJ indeed. I think this is a sign that I need to celebrate my French heritage and go buy that Lily of the Valley plant I just saw, I can't wear Guerlain, but I can celebrate Muguet. *angels singing on high* can we do white florals all year round? pretty please?